Top: Jackfruit sold online from Melissas.com in California. Bottom: Growing on the tree at the Regional Agricultural Research Center, Ambalavayal, India. The fruit grows directly out of the trunk or branches. The exterior is covered with spiny, knobby bumps and ripens to greenish yellow (photo Wikipedia). 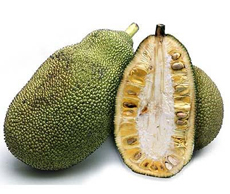 The jackfruit, (Artocarpus heterophyllus), is a member of the Moraceae botanical family, also referred to as the fig family or the mulberry family. This family of flowering plants grows in the tropical and subtropical regions of the world, where jackfruit is widely cultivated. The jackfruit tree is believed to have originated in the southwestern rain forests of the Indian Subcontinent, around present-day Kerala. The fruit is the largest tree-borne fruit: The largest reaching 80 pounds in weight, 35 inches in length and 20 inches in diameter. Jackfruit is nutritious: rich in carbohydrates, proteins, potassium, calcium, iron, and vitamins A, B, and C.
Due to high levels of carbohydrates, in some regions jackfruit is a welcome supplement to other staple foods in times of scarcity. The flesh of the jackfruit is starchy and fibrous: a source of dietary fiber. The presence of antioxidants (isoflavones, phytonutrients) suggest that jackfruit has cancer-fighting properties. Jackfruit is also known to help cure ulcers and indigestion. In Southeast Asia, jackfruits average between 15 and 33 pounds. Our local Asian markets tend to carry smaller ones; otherwise, it would take the whole family to carry one into the kitchen. They are available year-sound and can be imported from Asia or Mexico. California has a nascent jackfruit industry. Jackfruit is the national fruit of Bangladesh. Alas, the U.S. has not selected a national fruit; only 16 nations have. Austria and Germany both chose the apple: Here’s the full list. SHOULD YOU BUY A JACKFRUIT? Fresh jackfruit flesh is pink or yellow. When eaten fresh, it has hints of mango and melon. The flesh is soft, flaky (the petals) and sweet. Jackfruit may be a tropical delight, but it’s also a labor of love to carve out the edible fruit. Our first jackfruit experience was exasperating: We didn’t see this YouTube video. Instead, we winged it, anticipating slicing it like a melon. Wrong! Our blundering effort to dig out the bract and perianth* “nuggets” shouldn’t stop anyone with patience (and the video) from carving one up for family an friends. But first, look at these photos of removing the edible fruit from the flesh. It’s like getting the arils out of a pomegranate, but not as easy. You can also buy canned jackfruit in brine, syrup or water; and dried jackfruit for snacking or cooking. Beyond a fresh fruit or fruit salad dessert or shack, you can use jackfruit to make mousse, pie, pudding, smoothies, sorbet and so on. You can purée it into a sauce for sweet or savory dishes. Jackfruit seeds can be roasted and boiled. The fruit pulp is sweet and used to make bubble tea, candies, chips, dessert, jelly, ice cream, pickles, preserved fruit and wine. In Mexico, jackfruit is cooked down past the compote stage, effectively candied (an ancient way of preserving fruits there). In Thailand, jackfruit snacks are made by stuffing sticky rice into the empty seed holes. In the Philippines, you can find jackfruit ice cream, or a dessert of coconut cream with the raw jackfruit. In the U.S., jackfruit is often a meat substitute: in “crab” cakes, curries, lettuce wraps, salads and sandwiches. You’ll have no trouble finding jackfruit recipes on line. For starters, check out these jackfruit recipes. HOW SHOULD YOU PREPARE JACKFRUIT? Jackfruit can also be enjoyed unripened and cooked. The flesh of the Jackfruit can be used in desserts, as well. While you can buy a green fruit and let it ripen on the counter (or cook it), we prefer to buy a ripe fruit for dessert. Ripe jackfruits have a yellowish skin and spikes that have softened. The fruit should yield under gentle pressure. 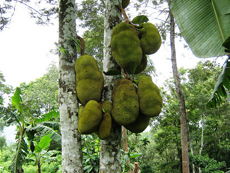 A ripe jackfruit has a distinctive, musky fragrance. A green jackfruit can be boiled, or used as a meat substitute. 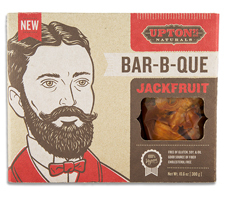 BBQ jackfruit has become popular among vegetarians and vegans. 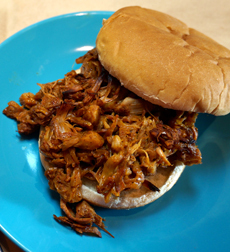 Top: A pulled BBQ Jackfruit sandwich. Here’s the recipe from MoreVeganBlog.com. Bottom: No prep work required: Just look for ready-to-heat-and-eat BBQ jackfruit from Upton’s Naturals, a producer of prepared vegan foods. They suggest using it on a sandwich topped with coleslaw, in salads, wraps or over rice. Jackfruit tree bark and wood are used for fuel, industrial products and timber. Jackfruit leaves, bark, flowers (bracts, flowers, stalks, stems), latex and seeds and are used in traditional medicines. Ready to add jackfruit to your culinary experience? The best way to start is to read up about buying and preparing it. Here are instructions with beautiful photography from SheSimmers.com. *A perianth is the outer part of a flower, consisting of the calyx (sepals) and corolla (petals). A bract is a specialized leaf.